You're looking at a Fender Custom Shop '57 Blonde Relic, Paul Waller Masterbuild. Click images for close-ups! Willcutt Guitars is listing this one as new. 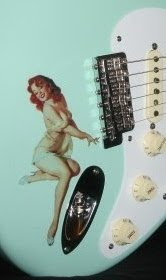 They hand picked this at the 2012 Fender Summer Summit dealer event, so it's old enough to sport a set of Abby wound Fat 50's pickups (before Abby retired). The finish is "NoCaster Blonde". Other features/specs include: Ash body, 9.5" radius 10/56 "V" neck, 6105 frets and all vintage style hardware.